With Readly you can read All About History Book of Weird History and thousands of other magazines on your tablet and smartphone. Get access to all with just one subscription. New releases and back issues – all included. There are some moments in history that steal news headlines and are remembered through the ages. But what about the forgotten intrigues and everyday oddities that have shaped our world? 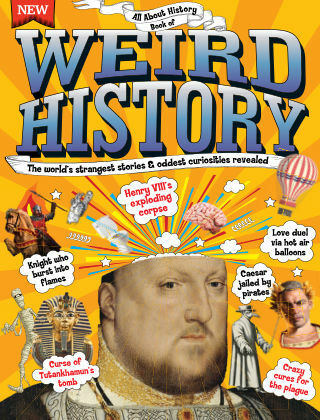 Transcending time periods and time zones, Book of Weird History collates the strangest facts, stories and creations of all time to capture the imagination and give readers an alternative history lesson. Featuring: Life & Death - Uncover gruesome rituals, embarrassing deaths and cruel tyrants through time. Crime & Punishment - Explore past societies’ laws and how they punished their criminal wrong-doers. Inventions & Discoveries - Witness the evolution of innovations and ideas via their primitive forbears. …And much more - Discover the weirdest tales from the medical, artistic and sporting worlds, too.